Miva liberates a world art dealer from an outdated Yahoo Merchant site to deliver a stunning modern shopping experience. Lotus Sculpture founder Kyle Tortora shares his passion for beautiful hand-crafted works of Eastern art from India, Thailand, and Cambodia via a unique online marketplace. When Kyle launched the Lotus Sculpture website in 2000, he chose Yahoo Merchant Services as his ecommerce platform. But the limits of this familiar brand's software became immediately apparent. Kyle chose to rebuild the Lotus Sculpture website using Miva as his ecommerce platform. From the beginning of the development and migration process, he found working with Miva to be a highly personalized and invigorating experience. Miva worked with Kyle to build an online presence that matches the high-end products available through Lotus Sculpture. Product display was dramatically overhauled, with a wealth of visual content, zoom features, and highly effective product videos. 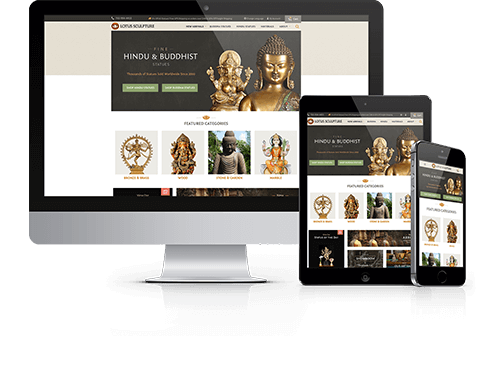 Since switching to Miva, Lotus Sculpture's revenue is up 180% , and mobile traffic doubled almost immediately upon launch of the responsive site. Sales via mobile are up by over 100%.